The TAX Collection was created in 2015 by Max Berman and Tanner Steslow out of a spirit of recognition for emerging artists and a new generation of creatives working across digital and physical mediums. Since our inception, the platform quickly gained a large following and blossomed into a community of artists and their fans, galleries, and collectors, from all corners of the world under the common cause of empowering the artist and championing freedom of expression. - We first became involved the "art world" back in 2015 with the creation of our Instagram that we still use as a platform to display work from artists all over the world! We originally started off collaborating with emerging artists on our (now extinct) clothing line. We would work with a few artists at a time, and come up with designs / artwork together to be displayed on the products. We then would create custom tags and anyone who purchased the clothing received information about the artist, where they could purchase more of their works and learn more about their craft. As our following grew, we gravitated towards displaying the art that we loved from these artists in physical spaces. In 2016, we worked with Guy Hepner Gallery for our first group show that we curated - and since then we have worked with the gallery to put on more than 10 shows together - a partnership that concluded in a curatorial residency we had there for all of 2018. How would you describe TAX Collection platform? How do you find artists to exhibit or display on TAX Collection platform? What specifically would entice you to show their works on TAX Collection website or Instagram? - We mainly find the artists that we post on our Instagram through submissions! We have found a number of artists this way that we have gone on to do shows with and collaborate extensively. We’re very grateful to be apart of such an incredible community of individuals. In regards to what draws us to specific artists - we don’t really have a concrete answer. It’s a feeling you get when you look at a piece. We think that’s something everyone can relate to. We've also noticed buyers becoming more receptive to experimental mediums and artists, as we have had artists who's shows have been their first, and they are able to sell out because their work has been so massively exposed on the internet. People can now get acquainted with artwork from the comfort of their home - and websites like artsy and artnet have really helped with this - taking the complexity out of buying in the art market, and really making it accessible for anyone with internet access and budget. On top of that - the past few years have given way to a monumental shift in who holds the power when it comes to artist - gallery relationships. Never has it been so accessible for artists to cultivate their own followings and collector bases. The role of the gallery is definitely being examined today and it’s definitely one of the more interesting conversations that are happening. There is no doubt we are currently in a time of political, economic and cultural unrest and upheaval. In your opinion, what role does the artist have in contemporary society? - Could not agree more with the state of society currently. It's an interesting question - I don't want to say all artists "should" be doing something, but for those who choose to make works that comment on society - I believe it's important to reflect on the state of the society - and comment / critique how they see fit. While many didn't respect the Dada movement, it was one of the most important critiques of society - and a definite external manifestation of an internal condition. There are also artists whose work maybe isn't commenting on current societal issues, and that's okay as well! Sometimes, in the midst of hopelessness and despair - it is important to view something beautiful, and maybe it doesn't have to mean anything to you beyond that - just to take you to a different place, an old memory, or maybe instilling hope for the future. Is there any advice that you can give to emerging artists who want to showcase their work? - Yes, of course! Really, it comes down to a few essential things when showcasing your work. I know we have talked a lot about Instagram and social media, but it is so crucial for artists to properly represent themselves and their work on these channels. If you haven't made an Instagram specifically for your artwork, it would be the first step to establishing an important social media outlet. Lots of times, artists have great work - but post maybe one picture on their personal Instagram which is cluttered with selfies and scenery. Having a dedicated channel shows that you're serious about your work, and wanting to showcase your talents to enthusiasts, collectors and galleries. What do you think of the art fair boom that has taken hold in recent years? How is it changing the market? - I think the art fair boom directly mirrors what Instagram did for artists - just in the physical realm as opposed to the digital realm. Now that artists have online platforms / followings - they don't necessarily have to go the traditional gallery route to be able to hang and expose their works. 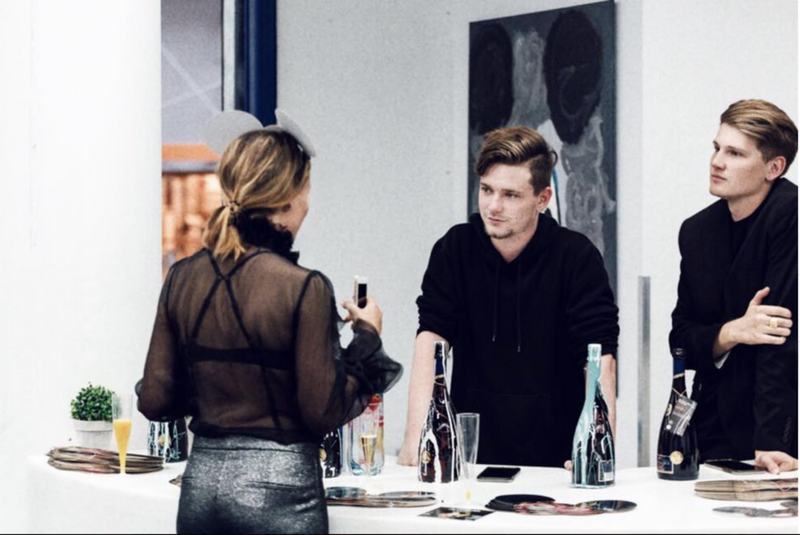 Instead, these artists are able to harness their internet reach and combine that with opportunities that these fairs present - allowing them to connect with their buyers and potential clients, and to be able to expose their works to a mass number of people - most importantly, people who are interested in the arts and in the industry. The great thing about fairs is that there are so many now that cater to different styles and collector bases. Artist can even independently represent themselves at some. While there’s always risk involved, having so many options allows artists to find one that really works for them. Are you frequent visitors to art fairs? Which are currently your favorite? - Yes we are! At the very least we always try to hit the fairs in our home base of NYC and Miami as well for Art Week in December! While we deeply appreciate all the fairs and everything they do for artists - some of our favorites right now are SCOPE - they represent such an incredible range of talent and Superfine! Art Fair - a great fair for emerging and mid - range artists that strives to highlight POC and LGBTQIA artists. We are also huge fans of TEFAF in NYC - and always make a point to check out the Context Art Fair, as they always have a wide selection of great works from some of the best contemporary artists. Yes and no - I think PR and exposure is great for artists! But, I also think in the age of social media, an artist can still be successful even if they are not initially in high profile websites / publications. Of course, so many opportunities come from exceptional press and it can definitely be a major catalyst in an artist's career - But, if an artist is talented and determined and making works that people want to buy - then they can absolutely succeed in the field without it. We have been doing a curatorial residency with Guy Hepner in Chelsea to present six unique exhibitions over the course of the year - we are currently on our last show which is on view for all of December. It's a solo show with an amazing artist Manuel Fernandez from Spain called "Abstract, Transfer, Protocol" - and touches on themes of digital gradients engrained in art, as well as the actual corruption process of data when it is transferred from one device to another. Our winter group show opens December 13th with Nonfinito gallery in South Sea Port in NYC - it’s our first co-curated project that we’re working on with Natasha Roberts from The Know by Natasha - which has been a really fantastic experience. We are planning many shows for next year, and plan on making our London Debut in February - as well as an upcoming residency we have planned with Tambaran Gallery in the Upper East of NYC. For the rest we can't speak about, you'll just have to stay tuned! Could you name some new and artists whose careers you believe are worth following? -Wow there are just so many! There's been tons of new artists on our radar, and it's a pleasure to share! Some painters we have recently been obsessed with are @oli.epp on Instagram, @loribellespirovski and @sambeeart, @superfuturekid - just to name a few. For mixed media work, we have been recently frothing over @shawnkolodny (his medicine cabinet series is so amazing!) and @kevinchampeny with his incredible sculpture pieces. It’s definitely worth the time finding some of the other great curation pages on Instagram that share work specific to your individual taste. Manuel Fernandezat at Guy Hepner.